I don't have a cat, this is my brother's. Kindest cat you'll meet. Likes to pose, seems like she knows when to stay still! Editor's note: Wow, stripes on stripes! How beautiful she is with her tabby self. Thanks for submitting this great picture, Barry! That is a beautiful cat. 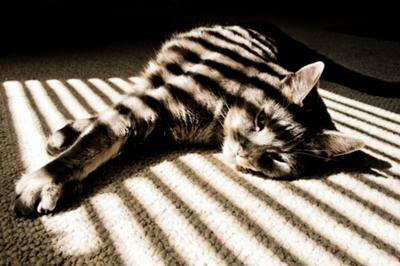 I love the stripes on stripes. You should get a cat. They are fun.